In the years since Ocarina of Time‘s release, we have been continually learning new things about the it. From glitches and shortcuts to developer stories, the information and knowledge surrounding this classic game is ever-expanding. A few months ago, a full 15 years after the game’s release, yet another new glitch was found. Today, though, we will be focusing on the distant past. An era when Ocarina of Time had yet to be fully realized, and was still in it’s fledgling stages. 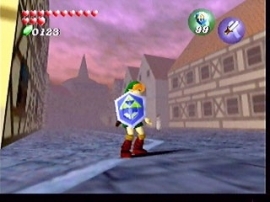 An era when, believe it or not, Ocarina of Time was still running on the same engine that powered Super Mario 64! I find these screenshots rather fascinating, as some of them are completely unrecognizable but others look like strange versions of Ocarina of Time from another reality. To see how the models and assets themselves evolved as well is very interesting. It might just be my own personal bias, but I feel that the version we have now looks much better. It’s also very telling to see the evolution of the HUD, particularly the control scheme and button layouts. At first there were no C buttons and A was used to swing Link’s sword, but over time you can see the addition of more buttons, eventually nearing the control scheme of retail version. At the end you can see some of the more outlandish things in the game, only accessible with a GameShark cheat cartridge. These images are beta assets, which makes you wonder why there is an Arwing, a fish that acts like it’s a pot, and a large grey humming stone. Overall, these screenshots are fascinating to look at. I love hearing about, or in this case seeing, behind-the-scenes things related to a games development. These in particular made my mind run amok with thoughts and ideas on how easily the first 3D Zelda could hfave been something completely different.